Last week we shared some photos from our launch party on Easter Saturday. Today we’re writing a little about the planning process, our inspiration and some of the elements which made the day so special. The first step in our planning process was a brainstorming session about the type of party we wanted. We are a friendly, creative company and we wanted a playful, pretty and informal party to reflect this. Since we are called curious we thought a treasure hunt would be a fun activity which would allow us to emphasise our name. As we were launching around Easter the initial treasure hunt idea evolved into an Easter egg hunt with afternoon tea. With our theme in place the search for a venue began. We needed to find somewhere that suited our style, branding and budget, with a garden area suitable for the egg hunt. This was not an easy task! 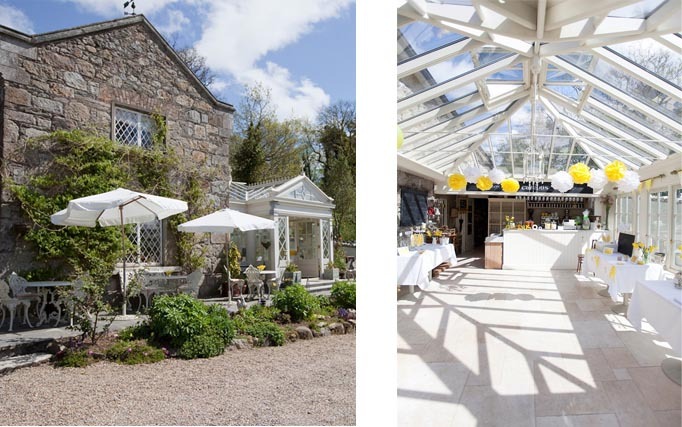 After lots of research emails and phone calls we finally found the beautiful Conservatory Restaurant in Laragh, Co.Wicklow, with yummy food, a lovely garden and a light-filled conservatory perfect for the props and photos we had in mind. The next step is one of our favourites – researching and gathering visual inspiration. Every design project that we undertake, be it an event, website, branding or poster, involves this research stage when we compile images and ideas from lots of different sources. When we have gathered enough visuals, we combine them into mood boards like the one below. We then decide which ideas we would like to explore and develop. Armed with our moodboard as a reference, we set to work creating invites, props and decorations based on our branding. We took inspiration from our logo for the light-bulb photo props, wooden letters and cogs, egg hunt stickers and mini pencils. Our colours of yellow and white were everywhere from our pom poms, balloons, pinwheels and bunting to the bon bons we filled our guests’ goodie bags with. Of course the most important ingredient for any party is some lovely guests! Posted on May 9, 2011 by rachel	This entry was posted in blog, events. Just stumbled upon your site and love love love this party styling! We need more weddings styled like this!